Go here for links to different forms of prayer including traditional prayer. Do we just let God decide for us? In the Catholic Christian tradition the form of prayer which asks for a specific outcome is called a prayer of petition. eg. "Dear God, let me do well in this English exam." As a Catholic Christian I was not brought up to use this form of prayer to pray for specific things for myself. Belief in God often goes with the belief that God knows better than you what would be best for you, and therefore the desire for Him to decide for you. Religious teaching therefore leans more towards simply allowing oneself to reconnect with God in such a way as to allow Him into your life to guide it. In my experience, Muslims are particularly strong on the idea of allowing God to decide what happens. They communicate this with the words Insha'Allah, meaning “God willing”. It is the equivalent of “Thy will be done” in the Lord’s Prayer. In the same way, some Christians add “(if it) please God” after saying what they wish to happen. More than ever, I am committed to allowing God to decide for me. But I now also believe that when we think we are letting God decide for us, we are often allowing ourselves to receive only what our environment and genetics have programmed us to receive. I believe in us choosing what we need and asking for it, but in the spirit of allowing God's guidance to lead us to a life that serves Him and thereby all others. Can God give us what we ask for? As a child, I don’t know that I even thought of God as being able to operate in the world to give me what I wanted. Yet, this wasn’t very logical as I prayed for health for other people, and my prayers were frequently answered. I now believe in a field of infinite possibilities within which we can attract much of what we ask for. Is it right to pray to get something you want? I believe that we are to expect God to meet our physical as well as our spiritual needs. And I find this view supported by the Bible. The more I expect to be provided for, the more my experience confirms it, and I now expect God to work in my physical world. At the same time, I also allow room for divine guidance. I set my intention and let it go. Read about how to use spiritual quotes as part of a program of mind discipline towards keeping your mind focused on the vision held in your prayer. I plan to say more about forms of prayer you can use to see physical changes in your world in a section entitled The Law of Attraction. The forms of prayer will include affirmations and visualisations. Affirmations and visualisations are often not thought of as prayers because they are not addressed to a Creator. However, they do call on the knowledge that the power of the Creator flows through us all. For me, this makes them forms of prayer nonetheless. What is your opinion? - do you pray prayers of petition or not? 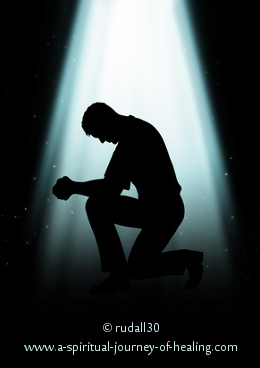 Share your thoughts and wisdom with us in the prayer forum. As well as talking to God we need to make time to listen. Move to read about people's experience of hearing God's voice. Read and choose from a List of Prayers on this spiritual website.